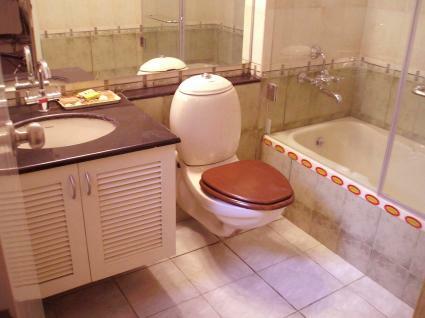 The bathroom is one of the most utilized rooms in your home. It's also one of the more expensive rooms to remodel, with national averages running at over $15,000 according to Remodeling Magazine's Cost vs. Value report. Learn what less expensive remodeling options you can take on to get the biggest impact at the lowest cost to help transform your bathroom into a place you truly want to use. A bathroom remodel typically involves tearing out most of what exists in the bathroom and replacing it with something new. This is where the big costs come in; even when you're choosing bargain brands for your new materials, you're still paying about 25% of the cost of the renovation on labor and design according to Consumer Reports. In other words, it's going to cost you whether you put in a bargain tile or a high end version. Redecorating, however, refers to cosmetic, fairly non-invasive changes to the space. This means leaving the footprint of the bathroom where it is and swapping out what's there for something new, lowering your labor and design costs. Examples of redecorating the bathroom involve replacing the toilet, replacing the vanity, replacing the vanity counter and sink, painting and refinishing existing surfaces. All of these changes can mean a completely new look for your bathroom for a lot less than a full remodel. Something to keep in mind as you make the decision to remodel or redecorate your bathroom is the personal value. While you can expect to get a portion of what you spend back at time of resale, many people make changes to their bathrooms to gain personal value as well. This is the value you take away from a space that is more functional and more comfortable than it was before. These inexpensive changes are aimed at making your bathroom more valuable to you as the homeowner, regardless of what you may get back at resale. 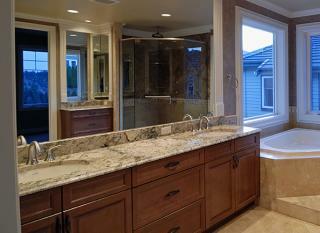 According to the Cost vs. Value report, a bathroom remodel recoups roughly 65 percent at time of resale. This holds true for most of the changes you make in the space, whether they are invasive or cosmetic. The most often recommended changes to a bathroom are usually updating it cosmetically so it does not appear outdated, while not updating it so much that it appears out of keeping with the rest of the home. To "remodel" your bathroom at a bargain, try using these five updates to get the most mileage for your money. A fresh coat of paint can do wonders for an outdated bathroom. In addition to toning down outdated tile colors by offsetting them with a neutral wall color, paint can also be used to change the color of those garish tiles, as well as refinish an old vanity or countertop. If you choose to paint over your existing tile and fixtures, make sure you use the proper materials. Use a urethane-based paint on the tiles and cover them with a urethane-based sealer. Use grout paint on the grout to change its color to match the new tile color. If you're undertaking a full bathroom remodel, the rule of thumb is to replace the bathtub at the same time. If you aren't doing a full remodel though, the cost of refinishing a tub is roughly 1/3 the cost of replacing it. 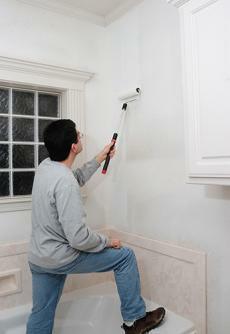 In a refinish, a company resurfaces the tub to remove scratches and dings, then reglazes it in a fresh, neutral color. This is a great option for a tub that is in otherwise good shape, but is an ugly color, particularly if you put a fresh coat of paint on any colored tiles at the same time. Replacing an old pedestal sink or outdated vanity with a new vanity and counter is one of the best investments you can make in a bathroom. A new vanity gives you storage space, which increases the bathroom's utility. The style of the vanity can also help set the style for the rest of the room. If you can't remove the old vanity, or can't afford to, the next best investment is in the counter. A new stone counter with a sink attached can be found for under $200, like a granite sink top from Lowe's. Combining this with a fresh coat of paint on a vanity can quickly transform the look of the room. Good lighting and ventilation are key to any bathroom. An outdated strip of light bulbs above the vanity can be a glaring eyesore, while a bathroom without enough light can feel dark and cramped. Modernizing older styles is seen as one of the biggest payoffs in a bathroom remodel, and outdated lights draw the eye not only to themselves, but to other outdated items as well. Invest in new sconces to sit on either side of the mirror or medicine cabinet, as well as a new overhead light with built-in fan. A well-lit bathroom will display much better, and a good fan will help combat moisture problems and mold. With the amount of time you spend in the bathroom, nearly any type of remodel will pay off in additional comfort and function in the space. Update your bathroom on the cheap with any of these options to transform your space.